As many of you know, the state of California is virtually bankrupt so there are huge budget cuts everywhere, especially in education and healthcare. A few months back faculty and staff members of the university dealt with big pay cuts and now it turned to the students. The UC Regents (board/ bestuur) who are in charge of the entire UC system (which includes 10 campuses all over California) voted here at the UCLA campus for a 1/3 tuition increase for students. On top of that they will cut back drastically in Teaching Assistance (this is done by graduate students and generates income to pay for their tuition) and staff. All this resulted in a big protest and strike for 3 days. Since the UC regents were having their meeting here at the UCLA campus, students from many other campuses came down to LA. The first day of the strike resulted in arrested students, tear gas attacks and guns were pointed at students. 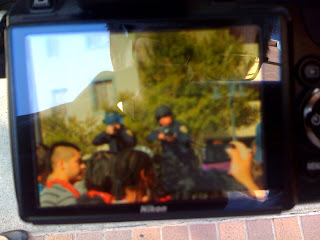 There was an army of police and three helicopters circling over campus non-stop. Many students will not be able to pursue their education and many think that it will be inevitable that the UC system will at one point turn into a private institution. This means a great lost of education for California and probably the only two campuses who will survive a thing like this will be UCLA and UC Berkley and the other 8 might disappear. Of course it is still a long way from that but this is the concern of many. Sorry for the long time it took for this update. Since people asked me what we are doing all day long, I will shortly explain the curriculum of the first quarter. - We take a Processing class from Casey Reas (for the people who don't know: Processing is a programming language that makes it kind of easy for artists to program their own work and Casey Reas is the one who 'invented' this language). First we did small assignments twice a week and at the moment we are doing a project. Next week that part of the class will be over and we start with physical computing (read: fooling around with an arduino). - We take a faculty seminar which means that one professor each week will talk about his or her work so we can get familiar with the professors and know where to go with certain questions. - We have a theory class about the history of media art. For this class we write essays and we will close this course by writing a paper. - We have a 'project course' in which we just finished a project. It needed to be wearable, the rest was open. We will put pictures of that on this blog soon. - I (Antal) do one more (undergraduate) course; Sound. Here I learn some conceptual things about composition, some theory about sound and I learn how to use Logic Pro (music software). For this course I will do several small projects. We have been to a American Football game; UCLA Bruins against Oregon. Which was fun. It was held in the Rosebowl UCLA stadium, which has a capacity of 90.000 people. When the world cup was held in the US, this was one of the main stadiums. We have been to the West coast premiere of the Yesmen fixing the world with one of the Yesmen present for a Q&A afterwards. This was in the Hammer museum (you've gotta see that movie when it is released in Europe, it's really great!!!) or check out what the Yesmen do on the internet. Also I've been in the desert last weekend with friends from Holland. I made some close by pictures of one of the worlds most venomous rattle snakes; Mojave rattlesnake. The desert was in Yoshua Tree, a national park 2 to 3 hours (without traffic) south east of LA. Yesterday we had a lecture of Jonathan Harris. I spend about 30 minutes talking to him about my project which was really cool. Casper's sister and mother have been in LA. They were making a 2 week trip through California and were in LA for 3 or 4 days. Casper spent the weekend with them. We all have had some nice Sushi in west-Hollywood and went op to the Getty-Center for an expo of Irving Penn one day. Well that was about it for now. We'll try to update the blog as soon we have some new interesting things to share with you. You can imagine that a lot of the days are filled with working which might be not the most interesting thing to read about for you. But if there is any specific thing you would like to hear about, just ask. And if you have facebook: We are more active there with short comments and more pictures. 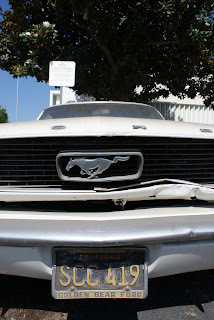 Here is another short update from L.A. Everything is now up and running, and honestly things are running in 6th gear. So far it has been great, but very very busy. Last friday we had a presentation of our work for the faculty, all the professors here are well known artists and very respectable in the field which kind of rose the pressure for all of us. But things turned out great and they seemed to like our work :D. That night we head a party at Christian Moeller's house. It was a great place at Mulholland drive (see the movie) and he is the neighbor of Justin Timberlake so that might paint a picture. Below you see a picture of the house and the view from mulholland drive. All the profs are really inspiring very nice and very good teachers. We have this processing class of Casey Reas which is amazing, the guy is really nice. You'll forget that he is Casey Reas pretty quick and feel he is just an ordinary teacher. Also the group of students is really nice. The only downside of this all is that we spent every day (including the weekends) in the studio working which leaves no time at all to discover LA. Of course there are plenty things to do and see in the field of art and media art and there is an opening for a gallery or show almost every day so we try to pick up some of those. So in short it is great and busy. We try to keep you updated soon! The UCLA campus is really amazing. 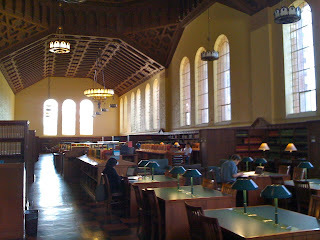 The libraries are like you know them from the movies (see picture below) and the place is like a city. With on-campus police, doctor, supermarket, store, gym, dentist, hairdresser, 3 or 4 stadiums, several pools, numbers of sport fields and so on. 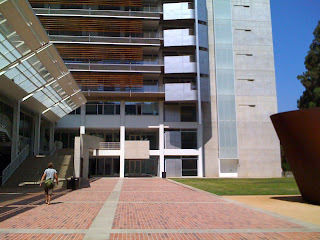 Our faculty houses in the broad art center. This is a really different building than all the other buildings (they are these classic, old-style buildings). The broad art center is designed by Richard Meier, the same architect that designed the city hall in the Hague. We'll keep you informed soon! Finally! We arrived in L.A. After a long trip. After running trough entire Heathrow to catch our connection flight which would leave in 10 minutes we remembered the hour time difference, David Beckham was on the same plane to LA and we didn't see darkness until the other night. Upon arrival we checkin at a venice beach hostel. Venice beach is one of the cool areas of L.A., the beach itself is called muscle beach. And as muscle guys as you know we are we checked it out. We are Antal and Casper, two students in the Media Technology program of the University of Leiden. From September until March we will be visiting UCLA's Design | Media Arts program as exchange students. On this blog we will keep you informed about our activities, academic as well as personal. If you are planning to do an exchange yourself and you have questions, don’t hesitate to ask and we try to answer it as soon and accurate as possible.